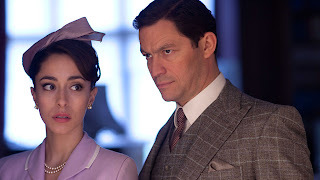 tv-ooh: tv we like to watch on the tv: The Hour series 2: Anyone fancy a cigarette? When something looks as good as The Hour it's easy to be drawn in. If that's a device to try and distract us from the occasionally misfiring plot or the - clunk! - slightly heavy-handed attempts at exploring some of 'social issues' of the 1950s, then, for the most part, it works. The show is visually seductive, even if by the end of an episode you quite fancy lighting up a cigarette. That's down to the fact that everyone seems to smoke, all of the time. 'Ooh, you've been unfaithful with some floozy or other while I've inexplicably got a job on a new cookery programme,' *takes drag of cigarette*. Or, 'I'd like to buy some special art photos please, you know, the nudey ones under the counter that you're pretending you don't stock because I'm trying to track down a violent attacker,' *takes drag of cigarette*. Whether framing every scene around a half-smoked Marlboro Light is an accurate depiction of how we were in 1956 is anyone's guess, but these 'tv journalists' spend so much time drawing on said fags it's surprising they get any time to make the current affairs show they're meant to be working on. But at least that means all the tedious ringing around for guests happens off-screen. 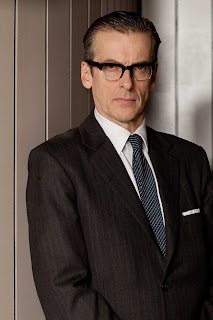 But we do get to see the post-show 'walking down corridor' bits - which often seem to involve some sort of management/producer conflict that doesn't make great tv either, even with the wise addition of Peter Calpaldi as a new head of news. Fortunately however, the whole thing looks so perfectly charming, with its rich colours, immaculate 1950s kitchens, clothes and interiors - even if that period accuracy doesn't extend to the occasional modern sounding language. All of which is fine as it's a drama and not a documentary, of course. But the show's magnificent appearance and eye for detail - a set dresser's dream - only almost covers how the show lurches from one thing to another. So, variously, we have Hector's infidelity, his wife's cool response to it, Bel's affection for a newly married Freddie, and Freddie's new wife throwing him an object in their one-room flat during a row (did she do this because she is French, and this is what the French do?). And highlighting the issue of racism - and not by depicting the French as violent, by the way, but by featuring a few characters with unpleasant attitudes towards black people - is worthy, but at the moment this element feels a little bit issue-led rather than character-led - and such social-realist concerns, like a period EastEnders only with more gloss, can jar a little onscreen. It's quite a contrast with the champagne lifestyle enjoyed in exclusive Soho member's clubs, all frequented by media types where dancing girls entertain the menfolk as they wheel and deal. Or perhaps that's the point - maybe it is meant to jar to highlight the differences in post war Britain - but why does it feel the need to do this? And added to the already bubbling soup of a plot is a mystery attacker, almost like it's been thrown in for good measure - as if the show's trying to pin any number of different tails on some sort of plot-line donkey while blindfolded, in the hope that some will hit the right spot. Yes, sort of like that. So what do I want from The Hour? What could make it better? I don't know - but perhaps it needs to stop trying to be all things to all people and focus on fewer, stronger characters. Having said that, it's still good to watch - and I'm glad it's got this second series to try and improve, and I think it's getting there as series two unfolds. And as it does so, we can all continue to admire the visuals and hope the storylines catch up. Just hope there's no 'main character gets lung cancer storyline' on the horizon anytime soon. 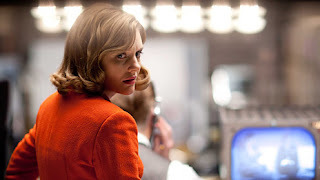 The Hour: Would we like it more if it was about The One Show? Smoking aside, it was an immensely watchable grown-up series. Loved the first series, even better second. More please! I think The Hour series 2 is excellent, even better than series 1. The storyline, the acting, the drama and tension, the sense of time and place (I'm 65, so I remember). Please let's have a third series.